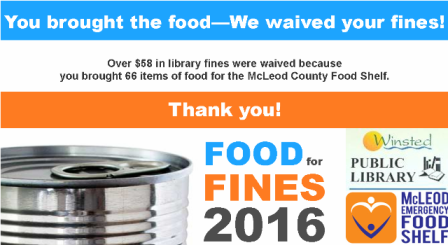 Do you have library fines? It’s OK. We probably do too. 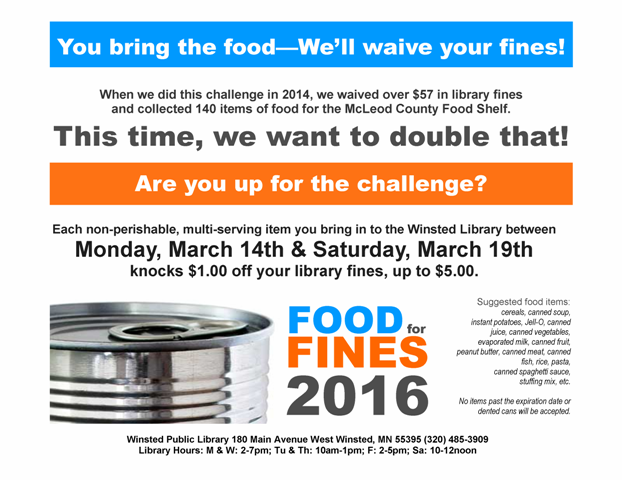 From Monday, March 14th through Saturday, March 19th, every non-perishable, multi-serving item you bring in to the Winsted Library will knock $1.00 off your fine, up to $5.00 per card! All items will be donated directly to the McLeod County Food Shelf at the end of the week. cereals, canned soup, instant potatoes, Jell-O, canned juice, canned vegetables, evaporated milk, canned fruit, peanut butter, canned meat, canned fish, rice, pasta,canned spaghetti sauce, stuffing mix, etc. No items past the expiration date or dented cans will be accepted. « Book Your Winter Getaway with the Winsted Winter 2016 Reading Program!